Just want to introduce some free applications that I was introduced to the other day. These are great little utilities that can help speed up ones work flow. 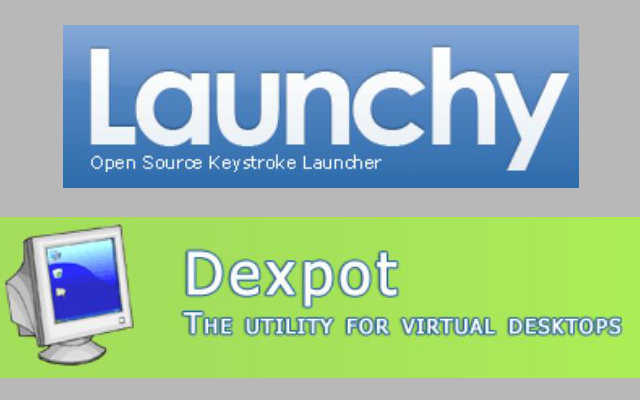 Launchy is cross-platform while Dexpot is for Windows users who like the virtual desktops that is found in Ubuntu. "Launchy" allows one to launch an application by merely typing the name. The app is launched by clicking the "ALT+Spacebar" (Windows) or "CTRL+Spacebar" (Linux). At first it will offer options for you to choose from and will learn from those choices. Launchy can be found HERE. "Dexpot" is a utility that enables you to have 4 virtual desktops where you can move specific applications or windows to. It is great for organizing your work when you (like I do) have multiple projects going on. Specifically useful when doing say ...Video Tutorials ...maybe? Allowing to have CamStudio and associated material on one window while having Blender and GIMP in another. Dexpot can be found HERE. How can you use Camstudio with Dexpot? When I record with CamStudio and switch to another desktop with Dexpot, it records the other desktop. I would like CamStudio to stick on the first desktop. Eric - Normally virtual desktops are used to isolate multiple jobs to their respective work areas so I haven't had the need to record across virtual desktops and not sure if it is possible. I will see if I can get CamStudio to do just that with either Dexpot or VirtuaWin. Eric - I just did a quick test with CamStudio 2.0 and VirtuaWin and it did indeed record whatever desktop I was on. I will do a quick video showing how if you like. Just let me know. Thanks Steven, I will give it a try. kromo - When you start recording in Camtudio, you can then move from one desktop to another and CamStudio will record whatever is on your screen. I use VirtuaWin instead of Dexpot since it seems to be more resource friendly. But keep in mind, when recording and running other apps such as Blender, GIMP, Photoshop etc, you will need a fair amount of memory. I was using 8Gig but have up that to 32 Gig ...the more the better.